In 2019, High Eye will release a thoroughly updated version of its proven HEF 32 unmanned helicopter system. The updates affect almost all parts of the construction and represent an even bigger advancement to competing systems. The concept and functionality of the HEF 32 remain unchanged, whilst the amount of parts has been reduced significantly and the Time-Between-Overhaul of the airframe has been raised to manned aviation standards. The newer aircraft will be easier to certify for BLOS operations using upcoming international standards, having more overall redundancy and traceability of its subsystems and components. At the heart of the updates is an entire re-design of the transmission structure and engine interface. The new gearbox systems are oil lubricated and completely maintenance-free between overhauls. The old engine has been dropped in favor of a more powerful and durable propulsion unit. Through modularity and interchangeability, configurable options like heavy-fuel capability are made possible, without compromising performance and reliability. 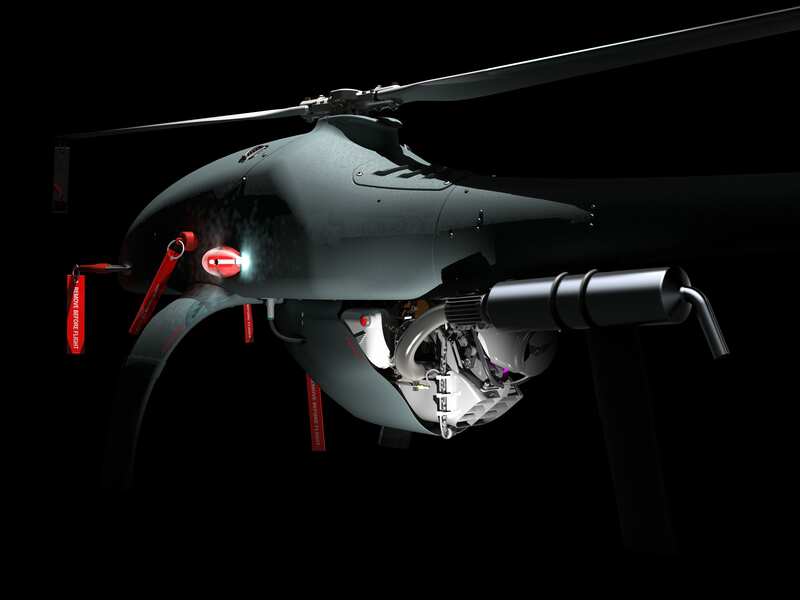 The rotor systems have seen thorough updates as well, as the main- and tail-rotor heads are now made entirely of aircraft-grade titanium and include maintenance-free, oil-lubricated bearing packs. The main and tail rotor blades are of a new and more efficient design. They are made using manned-aviation RTM production processes and are currently being bench-tested. All the protruding antennas from the old HEF 32 are no longer to be found on the new version. Fully integral antennas have been designed which are now spread over the landing gear legs, stabilizers and other aerodynamic fairings. The communication systems layout has been revised to include a completely stand-alone secondary radio system, which creates the highest achievable level of redundancy on telemetry-based communication. Other major improvements have been made to the flight control logics and capabilities. The new release allows full adaption of flight plans and flight modes to ship based operations, which means that the HEF 32 can be operated semi- and fully-automatically from smaller and unprepared ship decks. The new logics also feature expanded dead-reckoning capabilities, which allow the aircraft to maintain automatic navigational capabilities and redundancy after loss of GPS or external heading information. By integrating a laser-based altimeter as a standard, the automatic autorotational capabilities have been expanded with a fully automatic flare-out capability. More details about the functionality and improvements of the new design will be made clear as the release date moves closer. The High Eye team is confident that the upgrades will place the HEF 32 securely at the top of the market, providing cutting-edge helicopter technology in an unprecedentedly small package.